This week's Beer of the Week is a bit of a coincidence. How? Teena is on a business trip spending this week in Iqaluit, Nunavut (I would have loved to have gone with her but flights are $2,800 return ... that's a lot of money for a few days). 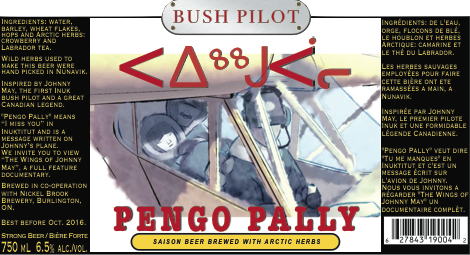 I was at the LCBO looking for this week's beer of the week and saw bottles of Pengo Pally from Bush Pilot Brewing. On the label, it says that this saison style ale is brewed with herbs hand picked in Nunavut. So today Teena is in Nunavut and I'm having a beer brewed with Nunavut herbs. Bush Pilot Brewery was created by Liliana and Vlado Pavicic, who at one time worked for an Ontario beer importer, Roland and Russel. Then they decided it was time to start brewing beers of their own and in February 2013 they released their first beer, Stormy Monday. They are looking to build their own brick and mortar brewery in the Hastings Highlands in Ontario.They aren't contract brewers, though. Instead they travel from brewery to brewery, creating their own brews along the way. Stormy Monday was brewed out of Niagara Brewing College, while Pengo Pally was brewed out of Nickel Brook Brewery. If your wondering why the company was named Bush Pilot, their website explains: Bush pilots and their planes have forged a unique place in Canadian history. Since the 1920's, they have played a major role in mapping and spanning our wilderness. The golden years were the periods after both world wars as prospectors fanned out across the north in search of precious minerals. 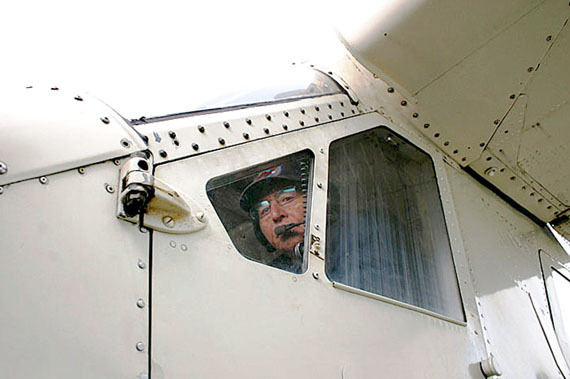 Lives were saved when pilots braved the elements to fly mercy missions to remote villages. The pilots risked their own lives to deliver medicine, supplies, mail or to fly in doctors, RCMP officers and surveyors. Unforgettable journeys through the pristine landscapes of our country, overcoming obstacles such as dangerous landings on unexplored lakes and rivers, tribulations with extreme weather, forest fires, temperamental equipment and close encounters with polar bears and wolves is why we are inspired by their story. Pengo Pally is named for Arctic Inuit bush pilot Johnny May. “Pengo Pally” means “I miss you” in the Inuktitut language and this message (in English and Inuktitut) was stencilled on the fuselage of Johnny May’s De Havilland Beaver, as a personal note to his wife Louisa. For most of his career, Johnny May flew in areas where topographical maps didn’t exist, and where the conditions were hostile and filled with danger. It was a vast and uncharted frontier where he landed on tundra or ice, depending on the time of year and the weather. A film of Johnny May is available for download from the National Film Board's website. I plan to watch it. It is made with three arctic herbs hand picked in Nunavut, Labrador tea, Small Labrador tea and Crowberry leaves. I know I won't be able to recognize the taste of any of them. It's fun that it comes with its own bottle opener on a chain. Could come in handy. Pengo Pally pours a cloudy yellow colour with a white head. The cloudiness comes from the fact that it is likely unfiltered. Saison yeast has its own slightly spicy aroma, which is quite prominent here. The head is strong and stayed for a long while. This saison is a little heavier than other saisons I have had but still very enjoyable. It is slightly spicy with another unidentifiable taste in it, which would naturally be the arctic herbs that I have never seen, smelled or tasted before. Pengo Pally is tasty and complex. Well worth trying. While Teena is absorbing the culture and sites of Nunavut, I am absorbing some nice Nunavut herbs in my Pengo Pally!